In 16th Century France, Diane de Poitiers is mistress to King Henry II. Learning of a conspiracy against the king, she is too late to act and both meet their demise. Now, centuries later, her spirit has reached out to you in hopes that you can change what has happened. Will you be able to change history? Turn back the clock and explore France to uncover the perpetrators of this conspiracy. Step foot in famed buildings and streets as you pick up the trail and discover clues. Search for useful objects and solve trying puzzles. Not only will you have to unmask the guilty, but you'll have to save Diane as well. Download free full version Amulet of Time - Shadow of la Rochelle today! 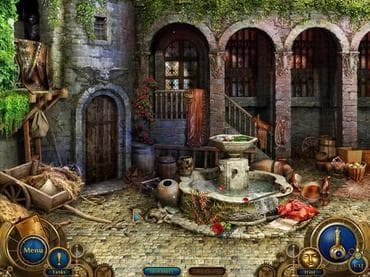 Free Game features: - Turn back the hands of time to prevent murder in this magnificent Hidden Object search; - Explore 16th Century France to find clues of the conspiracy against Henry II; - Step foot in famed buildings and search for important items; - Use special elixirs to help you on your quest; - Play entertaining mini-games and solve challenging puzzles. If you have questions about Amulet of Time: Shadow of la Rochelle game, please contact us using this form.